What would you say if someone asked you to try sake brewed on the Ginza? And, what if that sake had been made from rice grown in the heart of the Ginza, where people come from all over the world for high-end fashion, dining, and culture? I did not know exactly what I was getting into until I showed up at the Ginza showroom of the giant sake company, Hakutsuru one recent Friday evening. When I heard of an event at Hakutsuru to make sake in their lab and press it after only two weeks, I thought I could finally see their centrifuge in action. At a previous event held to meet one of their toji, I spotted a small centrifuge in their compact lab next to the event room, and I am pretty sure I was the only one who was really excited about seeing this machine, even more so than meeting the toji. (To be fair, the chat with Fujiki Toji was almost like hearing the whole Showa and Heisei sake making history and turned out to be truly interesting. I asked a lot of questions of him, so he wasn’t upstaged by lab machinary) But, when the opportunity arose to see this squat, washing-machine like appliance in action pressing sake, I thought “yatta!”. On the first day of the event series, they had a jug already filled with mash on each table waiting for the group to complete the process: steamed rice, water, koji rice, lactic acid and kobo were mixed on the first day (soe), then steamed rice, water, koji rice were added on the third day (naka). The fourth day for the sake moromi or mash in the jug, each of the six groups attending performed tome, which is adding more of the same ingredients: steamed rice, more water and more koji rice. In the self containing Ginza Hakutsuru lab, they steamed rice on what seemed like a cooking steamer you see at restaurants. 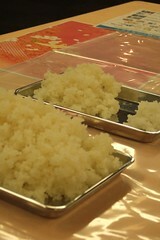 Then, they spread the steamed rice and cooled it with a hair drier, just like what you would use at home. Nothing fancy with the cooling, but the rice was another thing. They announced, “This smaller pile of steamed rice is Hakutsurunishiki which was grown on top of this building, then milled down to 60%.” I knew for the last decade or so, to ease unbearable summer heat in the middle of Tokyo, the city government has promoted planting grass on roof-tops, but I would never have thought that having a rice field on the roof of a central Tokyo office building was viable project, especially considering the location of this building, across from the Kabukiza in Ginza. The Ginza-grown Hakutsurunishiki was mixed with other rice and water from Kobe. We even mixed the moromi with a little wooden paddle to simulate traditional kaiire, then the jug was put away in the lab under controlled temperature in a water bath which let the precious beakers of sake brew for 14 days. Hakutsurunishiki was developed by Hakutsuru from the same stock as Yamadanishiki, so I guess that makes them sisters or brothers. At this major brewer in Kobe, they brew all year round and, of course, and they have their own rice and yeast strains developed in-house. 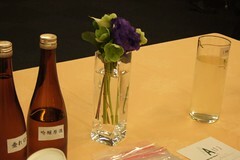 Two weeks later, the same group of people gathered at the same table to try out the sake we had made, so to speak. We all looked pretty excited. Matsunaga-san from the Hakutsuru Lab said each group’s mash, except for one, had a really slow fermentation. Then he let slip a shattering remark, “….and we did all the pressing for you, so you will now see just the final filtering process.” Darn! I did not get to see the centrifuge in action. Even though I knew I would not see anything when the machine was spinning, I wanted to see it in action for those 20 minutes–no matter what! 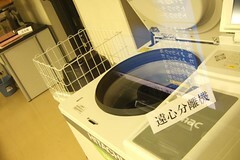 If someone asked me if I wanted to see a washing machine run through the spin cycle, I would say no. So, I don’t know what my obsession is, really. I guess I was really curios to see if sake pressed using a centrifuge is all that different from the conventional ways using fune or yabuta. Also, I was curious if the machine could handle a regular-sized shikomi vat. At least, I was able to see the dimensions of the bottle that went into the small spinning machine at the lab and see how much kasu or lees is left. The Ginza sake we made had a hint of fruit aroma and flavor, high acidity, was quite dry, and finished off very quickly and cleanly. Matsunaga-san was not completely satisfied with the result and said he would give it three points out of five. I would give four–That was pretty good. When compared with Hakutsuru Junmai Tarekuchi muroka nama genshu which had layered flavors that started sweet, then followed by umami, and finished with a pleasant nigami, our own Ginza jisake was like a little kid next to a giant, solid Sumo wrestler. But, still, it was pretty good, if I do say so myself. 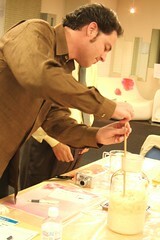 To see a complete set of pictures from this event series, please visit Tokyofoodcast on Flickr. Wow, a far cry from doburoku! How interesting. So they use the centrifuge for pressing? I went to their brewery down in Kobe last year, but I heard no mention of this process. Do you think you and Ted will start making sake more often? Te-Et-Zan or Et-Te-Tsuru? Hi! Hey if you are obsessed with the centrifuge, you have to shinkansen it down to Yamaguchi and visit my friends at Dassai. They have one! however… you don’t really see much when the machine is doing it’s thing. you just the the spun sake coming out of a tube. I am so jealous you got the experience to REALLY make “Sake in the City”. I would love to replicate this in NYC someday! Hi Melinda, They said the centrifuge is just for the lab, not for their actual production. How was Hakutsuru in Kobe? I will ask the toji at tokyofoodcast what his next batch is going to be… am I not supposed to say anything about this? Te-chan? That description of the Dassai centrifuge sounds pretty interesting. Usually, there’s a jar or container that gets lifted out of the centrifuge. I wonder how they get it to come out of a tube. I guess we’ll have to go back to Yamaguchi to find out.